Pietra Diwan takes pride in the master’s degree she earned in history back in her native Brazil. But a passion for historical accuracy may cost her the business she built here in South Florida. As a historian, Diwan pays attention to document details. That’s why she raised flags last month when Venezuelan friends here started posting Facebook photos of the ongoing anti-government protests in Venezuela. These were supposedly images of Venezuelan government brutality. But Diwan noticed that many of the Facebook pictures were actually from unrest in places like Syria and Ukraine. So she mentioned it on her own Facebook account. But Diwan lives in Doral, which has one of the largest Venezuelan communities in the United States. It almost uniformly opposes Venezuela’s socialist regime, which most expatriates blame for the country’s economic crisis and violent crime plague. As a result, rather than take the bogus photos down, some of Diwan’s Venezuelan friends lashed out. Including Alexandra Pirela. She began leaving voicemails calling Diwan a frustrated communist and a Chavista – a supporter of the Venezuelan government and the leftist revolution founded by the late Hugo Chávez. RELATED: Venezuela: Can Anyone Mediate This Mess? Diwan insists she’s nothing of the sort. No matter. Pirela, according to social-media postings viewed by WLRN, then embarked on a public campaign to smear Diwan and boycott her Miami business, Samba Gourmet, which sells popular Brazilian sweets called brigadeiros. 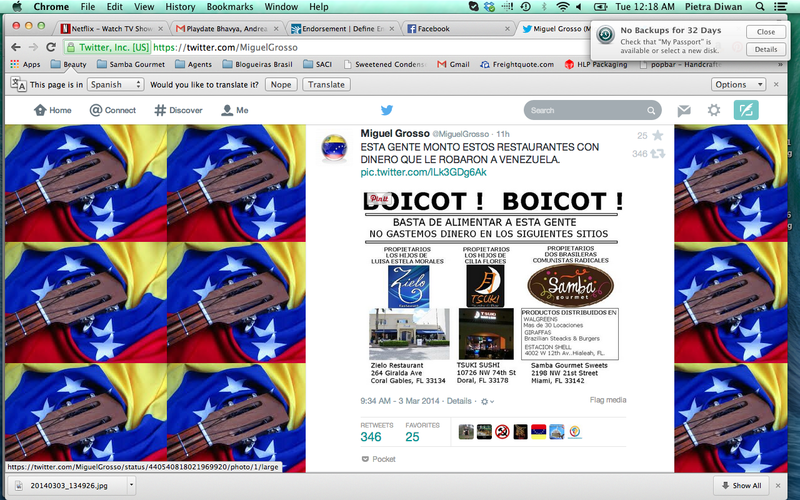 A Twitter page calling for a boycott of Samba Gourmet and other South Florida businesses. Pirela, who has moved to Houston, did not respond to WLRN interview requests. But her boycott has had the intended effect. Some of Diwan’s local clients, including a restaurant chain, have decided to stop selling Samba Gourmet products for the time being, and she has had to temporarily shut down the business. Worse, Diwan says, are the online threats, which also have her worried about the safety of her husband and 6-year-old daughter. Her case isn’t isolated. Boycotters also insist, for example, that a high-end restaurant in Coral Gables is owned by the son of Venezuela’s Supreme Court president. And that the owners of a Doral sushi restaurant are supposedly relatives of Venezuela’s First Lady, Cilia Flores. In each of those cases, however, the claims appear to be patently false. That sort of witch-hunt approach – the boycotters are especially on the prowl for high-profile Chavistas investing corrupt cash in South Florida – troubles Venezuelan community leaders like Luis Ramírez, president of the Coral Gables-based Venezuelan-American Chamber of Commerce. “It is just the kind of thing we came [to the U.S.] to avoid – unjust treatment,” says Ramírez. “If we have any suspicion that somebody’s investment here in the U.S. is not legal, I would urge the people to go to the institutions, like the police.” And not, he adds, to social media. Ramírez insists boycotts like the one against Samba Gourmet aren’t representative of the Venezuelan diaspora as a whole. And he’s most likely right. But while Diwan says she understands the complaints against Venezuela’s authoritarian government and its controversial president, Nicolás Maduro, she is considering legal action. Victims like her, she argues, have to prevent what she calls libelous behavior from metastasizing. And to many observers in Miami, it’s déjà vu – reminiscent of personal attacks suffered a generation ago by anyone who dared disagree with the hardline Cuban exile community. Diwan insists she’s walking that talk. And she hopes her defiant stand will get the social media mongers in Venezuelan enclaves like Doral to start walking it too. Or else lose historical credibility. These days, it’s looking more like a spent force. Today, March 5, marks the first anniversary of Chávez’s death from cancer. He was still in power when he died, and his revolution still rules Venezuela. For Venezuelan Protesters, A Time To Ask: What's The Endgame? There comes a moment in every political upheaval when the sound and fury of protests have to hook up with the clarity and practicality of platforms. For anti-government demonstrators in Venezuela, that moment's arrived. Since Feb. 12, the oil-rich but deeply divided country has been rocked by student-led unrest. Protesters are lashing out at President Nicolás Maduro’s heavy-handed socialist government and its inability to solve a raft of economic and social crises, including South America’s worst inflation and murder rates. Venezuela: Can Anyone Mediate This Mess? It’s a shame that Venezuela just severed diplomatic and economic ties with Panama, because their respective presidents – Nicolás Maduro and Ricardo Martinelli – have a lot in common. Yes, I know that Maduro is a radical socialist and former bus driver. And that Martinelli is a right-wing supermarket tycoon. Latin American leaders don’t know how to stop their violent-crime epidemic, but they sure know how to spin it. Former Miss Venezuela and telenovela star Mónica Spear and her ex-husband were murdered Monday night during a botched highway robbery near Puerto Cabello, Venezuela. Their 5-year-old daughter was shot, too, but survived. As the shocking news spread throughout Venezuela and then Miami, where Spear often lived and worked, Venezuelan President Nicolás Maduro hit a spin cycle I’ve seen countless other presidentes employ after high-profile homicides. Leopoldo López is a rock star among Venezuelans in South Florida. But in west Caracas he's the rich guy. And those contrasting images could affect the outcome of street protests playing out in Venezuela right now. But first the obvious: This week’s arbitrary arrest of López, a top Venezuela opposition leader, is a reminder that President Nicolás Maduro’s already scant credibility is evaporating during the anti-government demonstrations that have swept his country since Feb. 12.